As recently announced on the Ushahidi blog, the group is launching a check-in service a la Foursquare called “Crowdmap : Check-In’s” or just CI for short. I’m excited by the different applications that a free and open-source check-in-with-a-purpose platform can have for social impact. In this blog post, I’ll share some ideas on how activists might use CI for popular nonviolent movements when the service is launched next month at SxSW 2011. I will also highlight another very cool project called Sukey, which was just launched in the UK. Services like Foursquare provide a location-based mobile social networking platform that allows users to check-in at different venues to earn points and connect with friends. 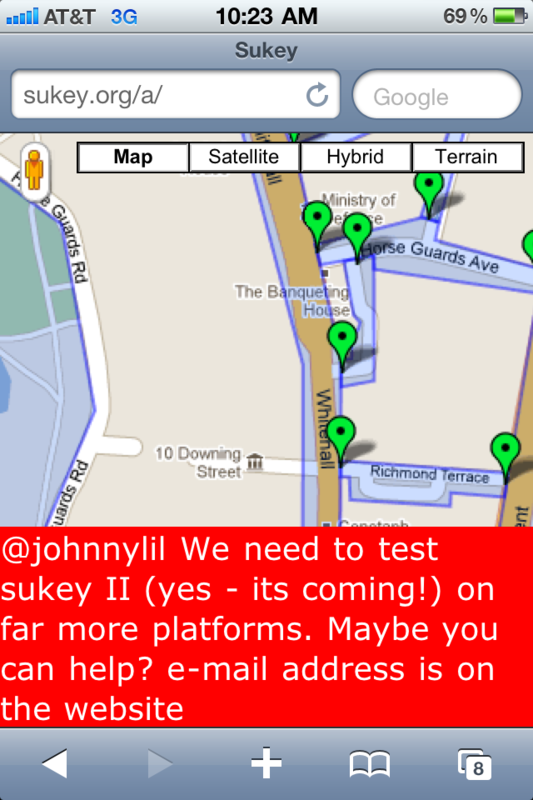 CI will work in a similar way but will allow users to create their very own “Foursquares”. This means that CI’s can be project- or group-specific, i.e., bounded to certain networks. Users will decide themselves where and what kind of points and badges to award to members of their CI network. This quick check-in service has obvious applications for students coordinating nonviolent protests, especially when they need to rapidly adapt to a changing situation. I this saw again recently in Egypt when pro-Mubarak thugs were swarming certain avenues of downtown Cairo. I recall seeing a picture shared on Twitter with tactical drawings suggesting where anti-Mubarak protestors should position themselves as a result. 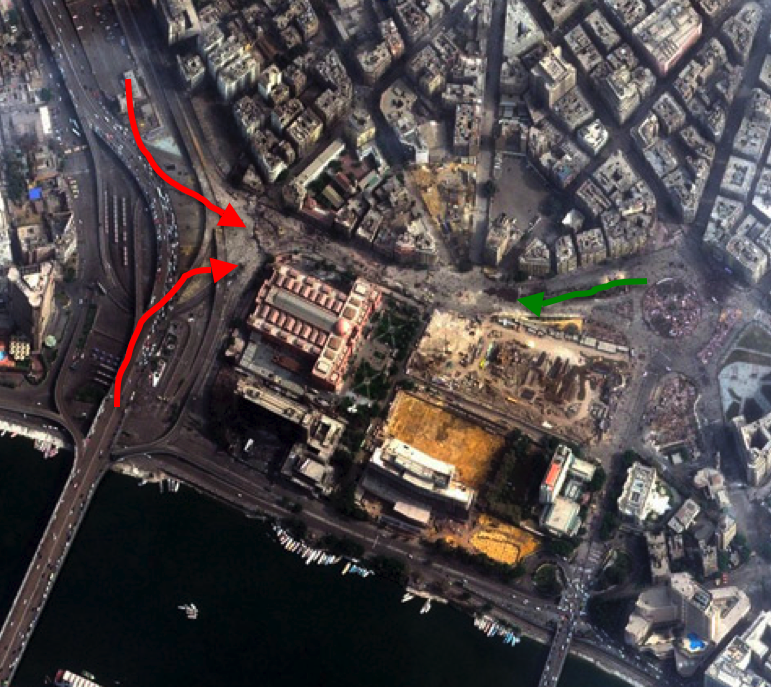 This was drawn on a screenshot taken from satellite imagery of an area in the center of Cairo. (I spent an hour trying to find the original picture again but to no avail, so if you know which one I’m referring to, please get in touch. The one below is for illustration only). With Internet and cell phone networks back up, protesters could use a check-in service to let others know where the thugs are being sighted and to recommend different locations to retreat or advance to. This would be a like a geo-tagged status update that could also be shared on your Facebook page or Twitter feed (minding the security implications). In addition, one could have pre-designated tags like “Thugs here”, “Don’t go here”, “Evacuate” etc., to avoid having to type when checking in. Call it the Q-CI feature, quick check-in’s. These alerts or status updates could then be embedded geographically, something like geo-caching. So if I happen to check in within a hundred meters of someone who just recently updated their CI status as “evacuate”, I would get an immediate pop-up message showing me these nearby updates. Someone helping to coordinate the protests remotely from a laptop could quickly embed areas (rather than points) as no-go zones if one or more updates show up with the tag “evacuate” at a given venue. Integrating Ushahidi’s new geometry mapping feature would make this possible. “Kettling, also known as containment or corralling, is a police tactic for the management of large crowds during demonstrations or protests. It involves the formation of large cordons of police officers who then move to contain a crowd within a limited area. Protesters are left only one choice of exit, determined by the police, or are completely prevented from leaving” (1). All you have to do is point your smart phone browser (it doesn’t have to be an iPhone!) to http://www.sukey.org/a to access the tactical map. The screenshot above is from their entertaining and helpful tutorial which you can access here. I really like the use of their simple “safety compass” which gives you immediate situational awareness about which direction safety (and danger) lies. The compass is specific to your GPS location and is updated in real-time as new reports are submitted by activists. These reports can be shared with all the other protesters and appear in the red box below the map. Protesters claim they successfully avoided police kettling this week by using Sukey. If you’d like to learn more, I highly recommend this excellent piece by the UK Guardian on the project. I think Ushahidi can learn a lot from this group so I will be meeting with the team in London next month. In the meantime, I’m really looking forward to SxSW and Sukey II. In a future post, I’ll describe how check-in’s-with-a-purpose platforms can also be used for humanitarian relief and disaster response. This entry was posted in Crisis Mapping, Crowdsourcing, Digital Activism, Social Media and tagged Activism, Checkins, civilresistance, Maptvisim, Sukey. Bookmark the permalink. “Crowdmap : Check-In’s” (CI) looks absolutely incredible. Excellent work. We at team Sukey are very excited about meeting up and swapping notes when you’re in London next month. Although none of us will be able to make SxSW in person, we’ll be following the podcasts and updates with keen interest. Hey Tim, thanks for your kind words. You and your team are the leaders in this application space so I’m really thrilled we’ve connected. Very much looking forward to meeting up in London! Regarding your future post about “how check-in’s-with-a-purpose platforms can also be used for humanitarian relief and disaster response.”, I will be quite interested to see what your thoughts are. There was a lot of brainstorming about it back when the specifications for OneResponse were originally hashed out and we recently had an intern build a proof-of-concept checkin/out mobile application for the OCHA 3W. The same intern did a POC of a tool like AroundMe/Google Places that let you find important contacts and relevant projects near your location. There is now some “talk” about ReliefWeb having people checkin/out of emergencies using their profiles. Perhaps we should touch base and see where we can get things moving? Thanks for your comment, would love to touch base, how about next week on Skype? I did catch a tweet of yours recently that referred to OCHA developing a check-in system. Any chance you could share more info with us and/or put me in touch with the intern who is working on developing this? Will it be open source, etc? The more we know, the more we can make ours relevant to the humanitarian community (and not just he big players but also local NGOs). Followed the link to Ushahidi’s new Map Geometry functionality and am officially celebrating. Ros and I lost a lot of sweat over that because it was such a stumbling block for Quartier par Quartier. It’s hard for me to convey just how important this functionality is. Many thanks to all who made it possible. This post really shows the strength of synergy between various ICT when combined with a full range of spatial data collection and representation. Fabulous stuff. Hey Shadrock, thanks for your kind note! Yes, QpQ was definitely something that made us realize we needed geometry functionality. Now looking forward to applying this in interesting ways! Project Information like SXSW was great, especially Information Application used, the base platform that is very powerful mobile phone networks, the technology is so powerful the world … thank you could read your article.